1 of 115 results for search "sessions"
(2-LP set) White Sessions label. (3-LP set) This set contains Supremes' recordings both with Diana Ross and post-Diana Ross. 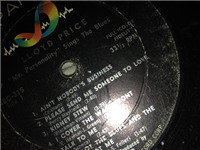 (2-LP set) Blue Abkco label. Complete set of 8 ingots. Each ingot represents a flag of a U.S. territory. (3-LP set) This is a reissue of For Ladies Only [P2 12943] with one additional disc (disc 2). Tan Capitol Special Markets label.